Studio Theater in Exile was co-founded by Mara Mills and Jeremy Gratt in 2005 after the closing of the Herbert Mark Newman Theater, Pleasantville. The Newman was known for producing original work. Mills and Gratt are carrying on that mission and expanding on it by making the works accessible to the community in public spaces. Studio Theater in Exile develops work with poets, writers, playwrights, theater, and visual artists, integrating art forms and social issue to produce theater that brings the art and community together. Studio Theater in Exile just received an “Opportunity to Grow”grant from the Alliance of Regional Theater/NYSCA for a portable lighting system to enhance their public work. Katori is a spoken word and visual artist. Katori has performed her poetry throughout Westchester and met at HVMOCA, where they began to work together. Her work as a community artist, with artist Evan Bishop includes “Words of Wisdom” and “Yes, Yonkers”, the first funded by Westchester Arts Council and the latter by a Yonkers grant. Her style is dramatic, humorous, playful, eccentric, and humane. 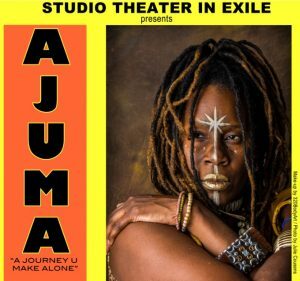 AJUMA is her first full length play. The cast includes vocalists Vanessa Day and Aramide, dancers Gretchen Simmons, Azaili Wideman, and Sunny Vazquez. mission: Studio Theater in Exile collaborates with playwrights and performers to create and develop original work. Studio Theater in Exile is a company without a space that collaborates with its environment. It is an outgrowth of the belief that theater takes place anywhere and can be performed anywhere – in the streets, galleries, libraries, museums, black boxes, backyards, and even on a stage. We have been working with performers and playwrights to develop work that can be performed in any venue. Co-founders, Mara Mills and Jeremy Gratt have worked together, since 1991, to present original work, based on the art in an exhibition, a social justice issue, history, or the spark of an idea. Karina Ramsey joined Studio Theater in Exile in 2018. This entry was posted in Press Releases and tagged #dance, Katori, Studio Theater in Exile, theater. Bookmark the permalink.